Mount Screens from 15 to 19"
The RM-LCD-MV from Middle Atlantic is an enclosure that enables you to mount a flat screen monitor into a standard 19" rack. The flat panel of the RM-LCD-MV allows you to install monitors with common VESA 75 and VESA 100 mounting patterns. 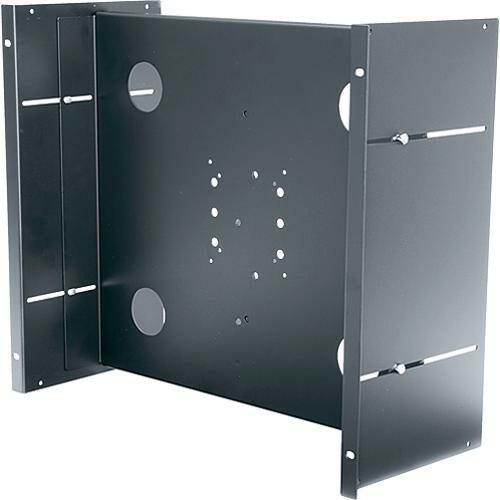 The enclosure is deep enough to have monitors of up to 17.38" (44.14 cm) in width to be recessed by 2 to 9" (50.8 to 228.6 mm) inside of the rack. With a durable black powder coat finish and the included lifetime warranty, the RM-LCD-MV provides a professional appearance, and the confidence in knowing you've made a good long term investment. Box Dimensions (LxWxH) 22.3 x 19.3 x 12.0"